I saw a few of these recently around Louisville Kentucky... and am very intrigued. Who made them? when? for what purpose? any specifications etc? and where can i get one? Delivery bike aka "truck bike". Fairly common up to the late 50s and made by several companies including Raleigh and Schwinn. Then for some reason non-motorized bike delivery fell out of vogue. Last edited by EjustE; 06-15-10 at 01:35 PM. From what I know based on what I've seen they were manufactured by a number of different companies. It's kind of hard to give rules or standards - they're all kind of uniquely suited to whatever purpose/job they were designed for. I see them on Craigslist or at local swaps pretty frequently. When I was in high school, I worked at a local, Mom & Pop grocery store. I used to delivery groceries to our customer using one of those Schwinn bikes, probably the S2 model with the larger basket. It was a tank! 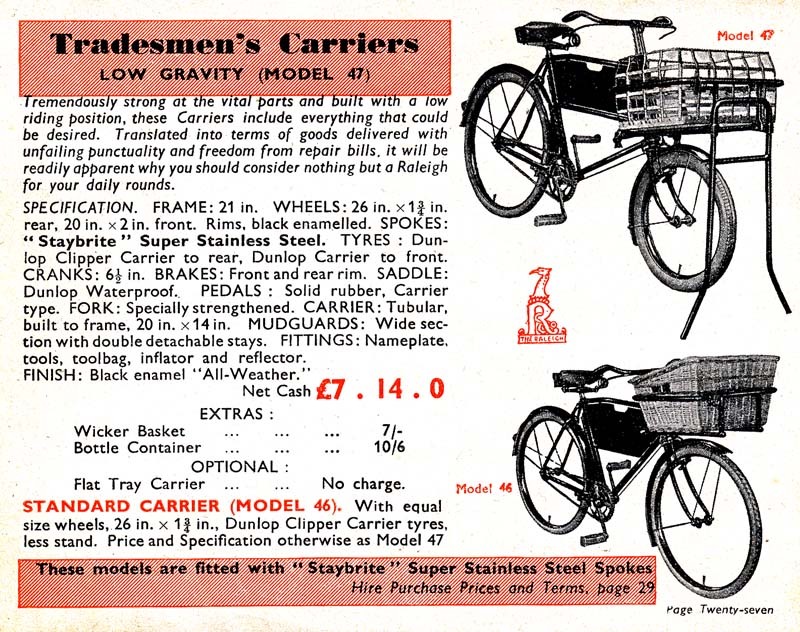 The small front wheel was important for lowering the center of gravity of the basket when it was fully loaded. The front wheel center stand worked very well to keep the bike stable and to prevent the front wheel from turning while loading the basket - even when partially loaded and unevenly distributed. That Schwinn was the real deal, the Electra is a pretender. Last edited by Mike Mills; 06-15-10 at 10:13 PM. I've probably only seen those in old movies before, if at all, and never took much notice, but I must say, that is a highly evolved, optimized design! +1. The Electra has a basket on the front wheel. 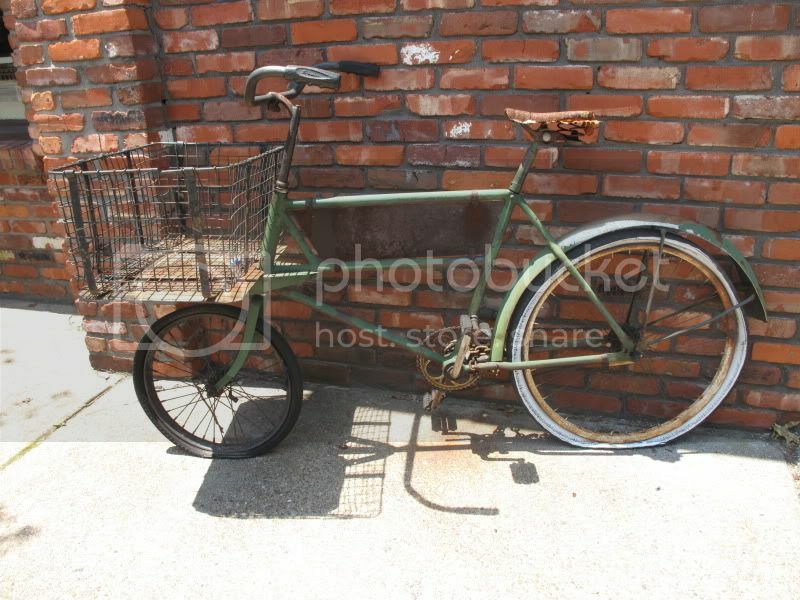 The real deal has a basket positioned over the front wheel, but mounted to the frame; it may look similar but in practice it is totally different. I have a Worksman LGB of unknown date, in fair to poor condition... in many ways a terrible bike, but you can carry a ton of stuff with it. Well, a quarter ton anyway. At any rate, the one in OP's photo is not a Worksman, or at least not the same model as I have, and doesn't look like the Schwinn either. What it is, I don't know. Are the cranks in the OP's photo not exclusive to Schwinns? I honestly don't know, but sort of assumed it to be a Schwinn. I suppose it is even a possiblity that it was built here in Louisville. From what I understand (I'm no expert) Louisville Cycle & Supply Co built American Flyer bicycles which were affiliated with the Schwinn name. Yeah, I don't know either. My "doesn't look like the Schwinn" remark was based just on the frame, which is different in overall shape and specific build details (seat stays, chain stays, that extra reinforcement at the head tube, etc). I agree that the crank (and stem) look pretty Schwinnish. Whatever it is I'd like to have one on the cheap for grocery runs. Where are you located? Mine is in zip 11951, and I'd be happy if it wasn't. The bike in the OP does look like the Schwinn, handlebars are shaped the same as well as the crank. But the dropouts are very un-Schwinn-like. I'm in 40205, but I'm walking a fine line with the misses regarding bicycle acquisitions. I'd prefer to stay married for now. The handlebars and crank/chainwheel look very Schwinn; you can even see the Schwinn logo on the grips. But, the frame is different from the ones I have seen; they look like one in the posted picture. The straight top tube and diagonal brace behind the steering tube are something I have not seen before. I ran into a brand of cargo bike I have never seen before in the old Ferry Terminal in San Francisco. It was being used to advertise one of the small shops now in the building. I took a picture of it; but I haven't had a chance to download it yet. It may have been a Velobris; but I really don't remember. C&V tool loaning resource. A concept. Any interest?